The United States and 11 other countries from both sides of the Pacific are currently negotiating the Trans-Pacific Partnership (TPP). The agreement is expected to set new benchmark for international trade through its comprehensive coverage of issues and binding regulations. It is expected to eventually mature into a regional trade agreement covering the entire Asia-Pacific. As of now, it does not include China and India, the two largest emerging markets and regional economies. The TPP has generated controversy for its excessive emphasis on trade issues, which have remained unresolved or unaddressed at the WTO due to differences between developed and emerging markets. It has also been criticized for adopting a negotiating style reflecting the US regulatory approach to international trade and also as a geo-political strategy of the US for supporting its strategic rebalancing towards Asia. From both economic and geo-political perspectives, the TPP has various significant implications for China and India that are examined in the book. 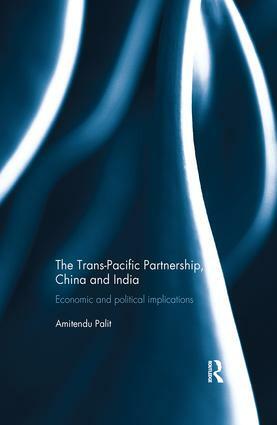 This book sheds light on how China and India's entries in the TPP are mutually beneficial and how both countries can gain from the TPP by gaining preferential access to large markets and using it as an opportunity for introducing more outward-oriented reforms. The book also cautions that US must reconcile to the rebalancing of economic power within the grouping that will occur following the entries of China and India. Otherwise, the TPP and China and India might walk divergent paths and trade and regional integration in Asia-Pacific may not ever converge. This book will interest anyone who wishes to learn more about the TPP and its future implications and challenges and China and India's roles in global and regional trade. China and India: how far from the TPP?